He was shocked and saddened by the news. A firm believer in the value of a liberal-arts education, Stone was president of Bridgewater College for 16 years before he retired in 2010. The prospect of Sweet Briar’s closure rang like a death knell for a family member. He also was surprised to hear Sweet Briar’s alumnae were starting a movement to save the college. “I wouldn’t have given you a nickel for their chances at success,” he says. Nonetheless, a friend in higher education whom Stone had known for years suggested that he could assist the alumnae in an advisory role. Stone agreed to help because, as a Virginian, he values the state’s great landmarks and the kind of education that young women receive at Sweet Briar. “I took seriously my offer to come and help. But I did think it was a long shot,” he says. The long shot, however, paid off. After a flurry of lawsuits, a hard-won settlement permitted the college to remain open, under a new board and a new president, Stone. The school’s financial position was bolstered by $12 million in cash donations raised by alumnae in over 100 days, with overall pledges totaling $28.5 million, to be paid over several years. Fundraisers had assured donors that, if they were not successful in getting the keys to the college, the donors would not have to fulfill their pledges. “To actually pull it off in litigation, with terms that were favorable to them, was a shocker. To raise the money they raised, it was amazing,” Stone says of the alumnae. By the time he became president of the school in July 2015, many of Sweet Briar’s students already had left for other colleges, and every faculty and staff member had been terminated on June 30, except those absolutely necessary to effectuate the closing. Stone rehired everyone in a posting on the college’s website. The journey is not over, but the 73-year-old Stone soon will be leaving. He announced in late April that he would step down around July 1 next year after a successor is chosen. Stone says he always knew that his role in helping to revive the college would not be a long-term assignment. His wife’s health and his age contributed to his decision to retire along with the achievement of financial and enrollment milestones during the past year that have exceeded initial expectations. Until he steps down, Stone says, he will continue to be heavily engaged in raising money and recruiting students. Higher-education officials from across the nation have told Stone that what Sweet Briar has accomplished — in reversing an impending closure — has been historic, if not miraculous, and will be studied for years. 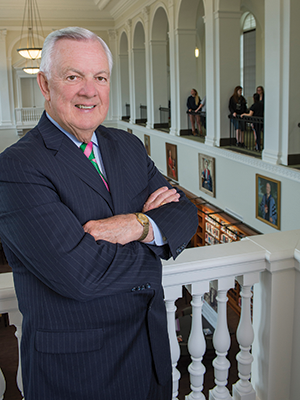 The Sweet Briar president says that one lesson for him has already emerged: A college must change if its graduates revise the relationship they have with the school. In Sweet Briar’s case, alumnae took over fundraising, acquired legal counsel, recruited students and even performed many maintenance chores. In return, Stone says, the college needs to provide its alums with an ongoing abundance of information about all aspects of the college’s operations, its finances, its budget, student recruiting and the like. “I would expect this robust engagement of alumnae to continue. I would expect to see volunteer work days,” he says, referring to the surge of alumnae who descended on the college’s campus last summer to paint classrooms, clean buildings and perform a wide range of landscaping chores. Stone says he once stepped out of his office and found an alumna, a medical school professor, weeding a flower bed. That level of passion and can-do spirit, he says, has become a defining element of the Sweet Briar experience. Stone has instructed admissions officers to bring every prospective student to him, whether he is in his office, in a meeting or somewhere else on campus. He wants to say hello and encourage prospects to enroll. The future of Sweet Briar, Stone acknowledges, relies very much on numbers: more enrolled students and more donations from alumnae and supporters. According to the college’s 2014-15 fact sheet, the degree-seeking undergraduate enrollment last year at Sweet Briar was 561. This year, it was 236, a 58 percent drop. The freshman class had only 24 students. Stone hopes to have 200 new students this fall, including freshmen and transfers. Sweet Briar had received deposits from about 125 students by May 1, but more continued to come in after that “soft” deadline. “It will take us about three years to get us back to the place where we were,” Stone says, referring to the enrollment at the time of the closing announcement. In its recent history, the college’s high mark for student enrollment came in 2008, when 647 students were on campus. Sweet Briar this year received a record number of applications, nearly 1,400, officials report. To remain financially stable long-term, Stone says, Sweet Briar will eventually need 800 students. He says the space and facilities for that many students mostly exists already. A renovated and expanded library opened in 2014, for example, and a new fitness and athletic center opened several years earlier, along with eco-friendly residential facilities. An $11 million bond issue in 2008 helped finance the fitness center and the new residence halls. Sweet Briar’s tuition for the 2016-17 school year is set at $35,800; with room and board and various fees, the total cost of attendance will be $49,060. The school recently was named to Forbes 2016 lists of Best Value Schools and Best Value Private Colleges. First-year students last fall received an average grant or scholarship totaling $21,032, with all degree-seeking undergraduates receiving an average of $20,052. Similar aid is expected this year, college officials say. Amelia Currin, a 19-year-old freshman from Coats, N.C., says Sweet Briar’s small classes and the mentoring provided by its professors encouraged her to enroll last year, a time that could not have been more precarious. “A lot of people still ask me, ‘What if the school closes, what will you do?’ And I always answer the same way: It’s not going to close. I don’t have to think about what I’m going to do,’” Currin says. She says that at Sweet Briar she’s not just another face in the crowd, as she would be at a large university. With small classes, she says, everyone has a chance to participate. “Here, the professors say ‘We want to hear your voice,’” Currin says. Katie Craig, a 22-year-old senior from Fredericksburg, says Sweet Briar’s willingness to meld her interests into a customized program sold her on the school. Craig, who is Sweet Briar’s student government president, says she learned about tenacity, resilience, loyalty and sisterhood at the women’s college. “It shouldn’t surprise anyone that the alumnae bound together and saved it. The ties are so great,” says Craig, who planned to take a job with a major insurance company after graduation. Stone says the aborted effort to close Sweet Briar cost the college approximately $40 million in economic damage. Included in those costs is lost tuition from students who transferred and others who were deterred from enrolling because of the uncertainty. Legal fees, $5 million in severance for faculty and staff, as well as the expense of repurchasing seven faculty homes, under a contractual arrangement, added to the financial burden. Sweet Briar has a goal of raising an additional $10 million by June 30, the end of its current fiscal year. In late April, the college’s governing board reported that more than $6 million had been raised to that point. Overall, the college wants to raise $30 million in its “Next is Now” fundraising campaign to carry it through the next few years as it recovers from the attempted closure, rebuilds its faculty and staff, and implements business and enrollment plans. Among other initiatives, development officials and Stone are asking the college’s biggest donors for major gifts of $1 million each. In addition, those who made pledges in the Saving Sweet Briar campaign will be asked to accelerate payment of their pledges. “Pay them early — get them in this year,” Stone says. The college is looking for every possible revenue source, including reviving the sale of hay on its 3,250-acre campus — once a standard practice — and renting rooms to travelers, wedding parties and others at its on-campus hotel. Under the settlement agreement that kept Sweet Briar open, Virginia Attorney General Mark Herring freed $16 million in unrestricted funds from the college’s endowment to use for operational expenses. College officials had no plans to tap those funds during this fiscal year. As of March 31, total value of Sweet Briar’s endowment was $74.5 million, including about $7 million in a perpetual trust that is held apart from the endowment. The trust provides an annual income to the college. By comparison, the endowment total was $77.4 million at the end of last year and $94 million at end of 2014, according the school. A Moody’s Investor Service report issued in April last year noted that Sweet Briar had operating revenue of only $27 million in fiscal year 2014, the lowest of 14 women’s colleges it follows. Moody’s said the school relied upon unrestricted funds from its endowment to help it meet operating deficits for at least six fiscal years, 2009-14. Sweet Briar’s goal is to limit annual spending from unrestricted funds to no more than 5 percent of the endowment’s total value. That spending rate, however, averaged 8.7 percent from 2011-14 and hit 9.4 percent, $8.5 million, in 2014, according to court documents filed during litigation over the school’s closing. Stone says the school incurred many additional costs last year as a result of the aborted effort to close it. Megan Behrle, 28, is among a number of Sweet Briar alumnae who stepped away from their jobs to help the college. 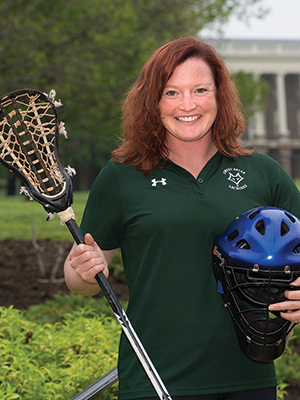 In Behrle’s case, she left a position with the International Monetary Fund to become the college’s interim lacrosse coach. She says that like many alumnae she wanted to give back to a college that had helped shape her life. “At the end of the day, empowering young women is something I’m incredibly passionate about,” Behrle says. Perhaps no one has done more to mobilize fundraising at Sweet Briar than Mary Pope Maybank Hutson, class of ’83, who left a job as executive vice president of the Land Trust Alliance in Washington, D.C., a national land conservation organization, to lead a major donor task force. She says Alexander Haas, a capital campaign consulting firm in Atlanta, donated 90 days to being the alumnae organization’s back office counsel. Meanwhile, a core of professional fundraisers, public relations executives and web graphic designers and internet marketers were drawn from the ranks of alumnae, and satellite fundraising offices were established in every state and in foreign countries where alumnae lived. Alumnae also recruited students. Hutson says the college had not had a dean of enrollment for two years before its closing announcement. 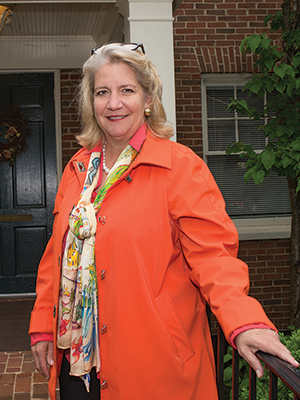 “As soon as we were able to regain the keys to the college in June, we trained over 450 alumnae through our office, the alumnae relations office and the enrollment office, to go out to college fairs, high schools and tell the story of Sweet Briar College,” says Hutson, now the college’s vice president of alumnae relations and development. Stacey Sickels Locke, a senior director of development at the University of Maryland and a Sweet Briar alumna, says fundraisers had no access to the college’s alumnae records or to annual giving or major gift data, as the former administration moved toward a path of closure. Alumnae created donor lists using donor honor rolls from past issues of the alumnae magazine, and the daughter of a former catering department employee found a seating chart from a fundraising campaign dinner and entered those names onto a spreadsheet. The internet was a godsend, Locke says, allowing alumnae to set up a hub for strategic planning and a portal for keeping alumnae informed about legal updates, news coverage, fundraising progress and the like. “People respond to urgency and they respond to truth,” Locke says, noting one of her main takeaways from Saving Sweet Briar effort. 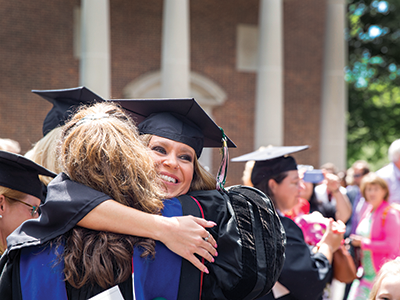 If any single moment can be remembered from Sweet Briar College’s year of tumult, it might be last year’s commencement address by Teresa Pike Tomlinson, the mayor of Columbus, Ga., and now chair of the college’s board of directors. Addressing what many thought would be the college’s last graduating class, Tomlinson inspired the students with a call to leadership in the face of what many perceived to be a hopeless cause — saving Sweet Briar. Reflecting on her speech, and on the actions of alumnae and supporters of Sweet Briar since then, Tomlinson says one lesson of leadership has emerged.